One of the Countless Stories of Shattered Kashmiri Families Losing Their Sons. Surrounded by his daughters and relatives in a mud and brick house located in central Kashmir, Abdul Rashid Khan is a broken man. His seven-year-old daughter sobs, with eyes fixed on door, waiting for the breadwinners of the family. A mobile tower mechanic by profession, 24-year-old Ishfaq Ahmad Khan left home for work and never returned. What did return was the news that he had joined the armed resistance movement of Kashmir. On November 27, 2018, Abdul Rashid Khan, 48, was shocked when he saw a picture of his son, Ishfaq, on social media holding an AK-47 assault rifle, which has now become a signature way for youth to announce their entry into an armed outfit. This news devastated the entire Khan family, especially Ishfaq’s four sisters. This was another shock for the family, as Ishfaq’s younger brother, Umar Khan, 21, was earlier detained by the Jammu and Kashmir police under the Public Safety Act (PSA). Sitting in his one-storey house located at Goripora Sozeith in Budgam district, Rashid narrated his tale about how his once happy family was shattered since his two sons distanced themselves. During the Urban Local Body Elections in Jammu & Kashmir, held a few months ago, police arrested stone-pelters in many areas before the elections to prevent any law and order situation. On October 8, 2018, policemen from Parimpora police station surrounded Rashid’s house in the middle of the night and asked him about Umar’s whereabouts. Rashid asked “Kheari Cha”? (is everything alright?). He said that without replying to his question, a cop grabbed him by his collar and threw him in an armed vehicle. “Bring Umar to the police station tomorrow” a cop told Rafiqa, Rashid’s wife. Umar’s family said they were scared to produce him before the police, as any harm or torture would have worsened his condition as he was physically weak. Considering Umar’s health, Ishfaq decided to go to the police station. “I’m suffering from multiple heart disease, I need to take medicine at regular times,” said Rashid, who was released. But, Ishfaq was detained for 15 days. During this time, Rashid kept visiting the police station pleading to the Station House Officer (SHO) to release his son and asking why they were looking for Umar as he was not involved in any case. But, Rashid says, that instead of providing proper details, the SHO would abuse him. “Whenever I went to the police station, the SHO used to abuse me, thrash me, and asked me not to come to the police station,” recalled Rashid. At times, the SHO would abuse me in front of Ishfaq which used to make him angry, he added. On October 23, Ishfaq returned home with memories of 15 days spent in lock-up and torture marks on his body. Rashid said he decided to take Umar to the police station, as the police had promised everyone that they would put him under arrest for a few days only. At this point, Ishfaq requested the family not to take Umar to the police station as he feared that the police would hold him under PSA. However, Rashid said he kept faith in the promise given by the police in front of the villagers. Meanwhile, Rafiqa noticed a change in her son, Ishfaq, who continuously complained of pain in his legs and back. His beard was pulled out by the police, and “he told me the police abused and tortured him,” said Rafiqa. Ishfaq’s youngest sister, Nadiya Jan, who is seven-years-old, was the only person who could touch his face and ask him what happened to his beard. She would massage his head and put ointment on his wounds. The bonding between the siblings was close, said Rashid. 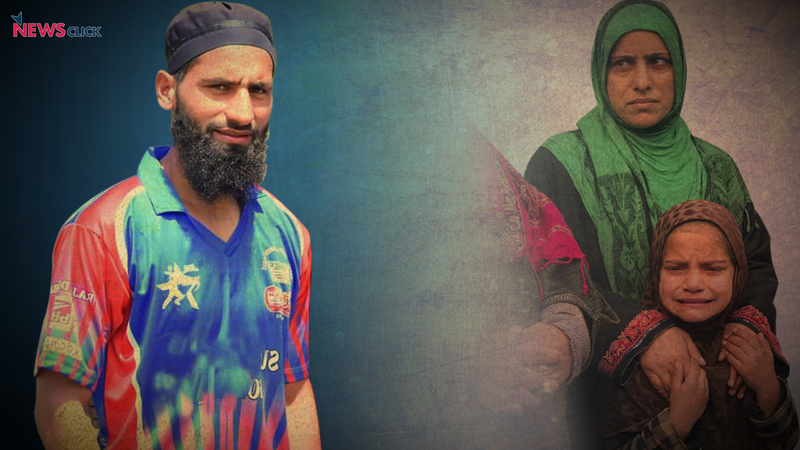 On October 26, Ishfaq told his mother that he was going to work. His work with an electric tower construction company would sometimes keep him away from home for days. On October, 27, Umar was detained by the police. After that, Rashid and some villagers were asked to sign a blank paper and hand over Umar’s ID card as they were told that his bail papers were being prepared. “They asked us to come after a few days and take Umar along,” said Rashid. On November 7, Rashid, accompanied by his relatives and villagers, went to the police station and enquired from the head constable about Umar’s bail. But his hopes were dashed. “We have sent your son to Kotbalwal Jail as he is booked under PSA,” a policeman told him. Rashid, who broke into tears, said he tried pleading to the head constable, but was pushed down and warned that they would detain him too if he came to the police station again. All this while, thinking that Ishfaq was at work, the family decided not to inform him about Umar’s PSA and the behavior of police towards the family, as he had warned them about it. But, little Nadiya asked her father for his phone and tried to call her brother to inform him about the development. “I tried to call “brother” many times but his phone was switched off,” said Nadiya. The family thought Ishfaq must as usual be working in a distant area, which is why his phone was switched off. Rashid and Rafiqa tried to maintain calm at home, praying for Umar’s release. But this did not last long. On November 26, a picture of Ishfaq went viral on social networking sites in which he was seen holding assault rifles. According to the information provided with the picture, Ishfaq had joined Lashker-e-Toiba militant outfit (foreign militant outfit active in J&K) on November 10. Since then, Rashid and Rafiqa, both suffering from heart ailments, have been almost bed-ridding. Their three daughters are hoping for their brother to return home as the family has no source of income. As of now, relatives are helping Rashid manage his daily and medical expenses. Wazira, Ishfaq’s elder sister, recalled how her brother would save money for her marriage, family expenses and medical expenses of his parents. Ishfaq was also known as a good bowler. He played for the top cricket club in the valley, the Kashmir Knights. All family members have been appealing to Ishfaq to return, and have been praying for Umar’s release. Nadiya, meanwhile, keeps looking at the door, waiting for her brothers to return and fill her school bag with candies, which they often did. (This is Part 2 of this story.